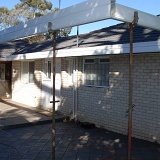 Our new pergola is completed. Just have to tile the old patio now. Tara surprised him the previous weekend with a trip to Melbourne to watch Australia play Ireland in the Bundaberg Rum Rugby Series. But that’s not all… she also organised seats in the Bundaberg corporate box! 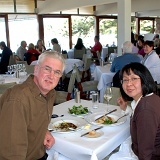 For lunch we go to Balmoral Beach for fine-dining at the Watermark Restaurant, and the food was just wonderful. Then Kitinn and the Tapias shout dinner at Bar Me, a music bar in Kings Cross where Carlo was gigging that night.